Lloyds Group #DOW #DAX In the UK at present, two things appear certain. Neither Lloyds share price, nor our competent parliament, can make a decision about the future. While our national leaders embrace of indecision is well documented, Lloyds Bank is less so. Last time we reviewed this, we gave a suspiciously precise number which the share required actually close above to make recovery to 67.6p confident. At present, our ridiculous number is at roughly 65.332p and the share price is making efforts to avoid closing a session above this point. As the inset on the chart shows, some quite silly acrobatics are taking place to avoid closure above BLUE. If nothing else, it tends confirm we’ve been watching the correct trend and therefore, closure beyond such a level should prove capable of some reliable shuffles upward. The ruling scenario suggests closure beyond 65.33 shall make growth to an initial 70.6p fairly confident. Secondary, if bettered, is a longer term (or next day) 77.7p. We quite like the visuals surrounding the 77p level, due to some prior history around this point. For now, we have our doubts, suspecting Lloyds shall once again be shoved back in its box. On the chart, we’ve painted the present Brexit date (next week) and in Gold, the next proposed Brexit date at the end of June. This creates a scenario where Lloyds risks proving trapped for a while longer with the June Brexit share price date sitting at 63.8p as a maximum. 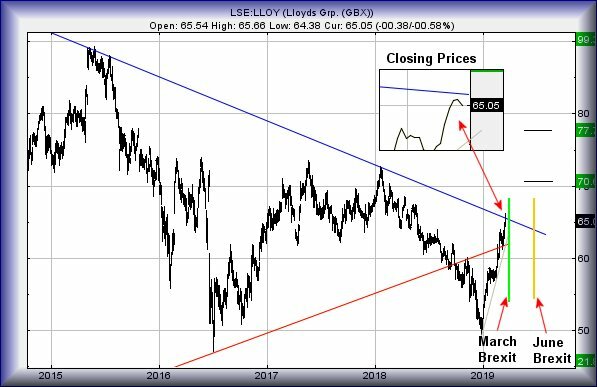 If we’d to guess, it seems possible for Lloyds to oscillate between the 57 and 64 level until June, when doubtless everything shall again be in a state of flux. Sorry if this sounds confusing but we’re confounded with overall market behaviour.